Discussion in 'Boxing Discussion' started by Wanderlei4Life, May 12, 2014. Eight weeks prior to the fight, which took place at the MGM Grand Garden Arena in Las Vegas on 7 April 2001, Hamed was 35 pounds overweight. At the end of training camp he still didn't make the weight, and arriving in Las Vegas he spent the two days before the fight trying to shed 2 pounds in his hotel, by shadow boxing in steam rooms and running on the treadmill at 5am. Marco Antonio Barrera had "trained like a monk" in the Mexican mountains, while Hamed trained in Bing Crosby's old house. Emanuel Steward had arrived to oversee the last two weeks of Hamed's training, including sparring, and was worried immediately. He had seen Barrera look razor sharp only a few months before in a stoppage win in Las Vegas, and watched Hamed look ragged in sparring with young Mexicans hired by the camp where his timing was woeful. After late night training sessions I always re-watch classic fights to score and pick up techniques. Through the first two rounds, I have MAB up 20-18. The crowd is going nuts which adds to the excitement of the fight. Round 2, they both get into a tangle and fall to the ground. MAB is pissed and contiunes to drive his shoulder into Prince when being held on the ground. Will post final scorecard when I am finished. I've only very recently (last couple days or so) been watching Barrera fights. So far i've seen his fight with Jones, Mckinney and Morales 1. I was planning on watching the Hamed one next. Barrera is a bad mf'er. Here's my pbp and scorecard for the fight. 5 - Slow round favors Prince and his style. Trade 1 for 1. Prince is 10-9. Foreman is great and funny as a commentator. 8 - Even round through half until Barrera lands a counter right and hurts Prince late. Barrera 10-9. 9 - Prince was winning the round until 30 seconds and Barrera lands 3 big shots. Makes Prince's whole body move which adds to the dramatics. Barrera 7-2 on my card. 12 - Last round, crowd excitement enhances the fight. Barrera snaps and slams Nas into the ring post wwf style! lol, but Barrera still wins the round. 9-9 with the deduction for the foul. My final scorecard - 116-111 and the new Featherweight champion Marco Antonio Barrera. Great fight. MAB was so technically sound the entire fight, very impressive. Lost his cool once but overall fought a masterful game plan and never got tired. Say what you want about Prince but I believe he is an HOF boxer for sure. Definitely one of a kind. His reflexes and power was legit for Featherweight and below. Ate a ton of good shots from MAB and never got dropped. The Prince was an awesome fighter despite his antics, and it took a great one to take him down. Just on MAB, I remember him fighting Robbie Peden, as an Aussie I was right in Peden's corner but I knew he had virtually no chance. Hamed deserves more credit than he typically gets for that Barrera fight. 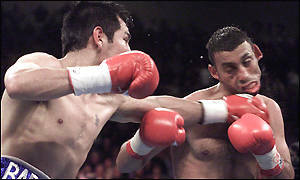 Marco is an all-time great, and Naseem hung in there with him for 12 rounds. He even managed to pick up two or three along the way . It wasn't a shut-out, and the Prince wasn't as much as knocked down if I recall correctly. Not bad for a flashy, unorthodox fighter who relies mostly on reflexes and athleticism, if you ask me! Naz made enough money he could slide off unfortunately. Barrera was his daddy and morales beat him twice IMO. Awesome fight. I knew deep down Barrera was gonna win. Honestly I'm pissed at Hamed after this. He robbed us of numerous great matchups. You thought sure many of these fights would happen then they just become fantasy fights in your mind. Oddly enough I had Barrera beating Morales all 3 fights. I reckon you had Morales winning the first two. I thought 1 and 3 were pretty clear. Even though 1 was as action packed as could be. The second fight is interesting. Barrera came out looking to box as opposed to slug and it felt to me people automatically gave all those early rounds to Morales, but I thought Barrera did better than that and got some of those early rounds, then took over more in the second half of the fight and scraped out the W on my card. Though my memory is shoddy... that's the best I can remember of that awesome trilogy. Actually go back and watch his earlier fights.. it was fun to see his style evolve over the years.. more so than maybe any fighter Ive ever seen, he successfully changed his style from a Chavezesque stalker to a wonderfully balanced boxer.. it was a pleasure watching him change into that over the years..
Nas vs a young manny at featherweight would of been fun. Watching Barerra smack that little goblin around never gets old. I loved this fight...I knew what MAB was capable of coming into this fight and enjoyed the clinic he put on. I also enjoyed his fight with johnny tapia...that was another good one Tapia was crazy.